When I had my first child, what few items I bought were always unisex. I knew I wanted two children, and I also wanted to reuse whatever clothes and products we would need. Colette Kids offers unisex designs for little ones, and the best part is they are organic! Made in the USA, Colette Kids onesies are constructed of 100% USDA Certified Organic Baby Rib cotton that is combed for softness and comfort. 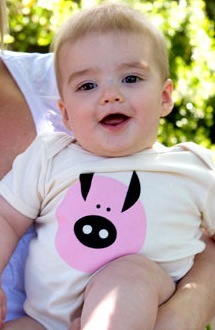 The graphic images have cute names and stories, like Charlotte the Pig. “Charlotte is an explorer. She likes bok choy and the water barrel.” Each item of clothing is silk-screened by hand. Like many of the organic kid’s clothing companies we feature on Eco Child’s Play, Colette Kids was started by a mom. When graphic designer Anita Lee became pregnant, she decided “to dabble into the world of fashion as she was expecting her own bundle of joy.” As I have said before, anytime I can support an organic company started by parents, I will choose to over large corporations.